I had one of those days this weekend where nothing was going the way I wanted it. The kids were fighting, which felt like the entire weekend, Jake was gone, and I just couldn't catch a break. So I thought we just needed to get out of the house, that would solve all our problems. We got ice cream, that was good, headed to the library, that was fun. But then, it was time to leave and all of a sudden, my sweet little boy turned into one of those children you see in the grocery store having a fit, screaming, throwing things, running away from their mom. That all happened, in the library. Needless to say, our outing, not the best idea. The only way I knew how to fix this disaster of a day was to make a dinner that would make me forget all about the fighting, toy throwing, and meltdowns. And let me tell you, it worked. This meal was that good. 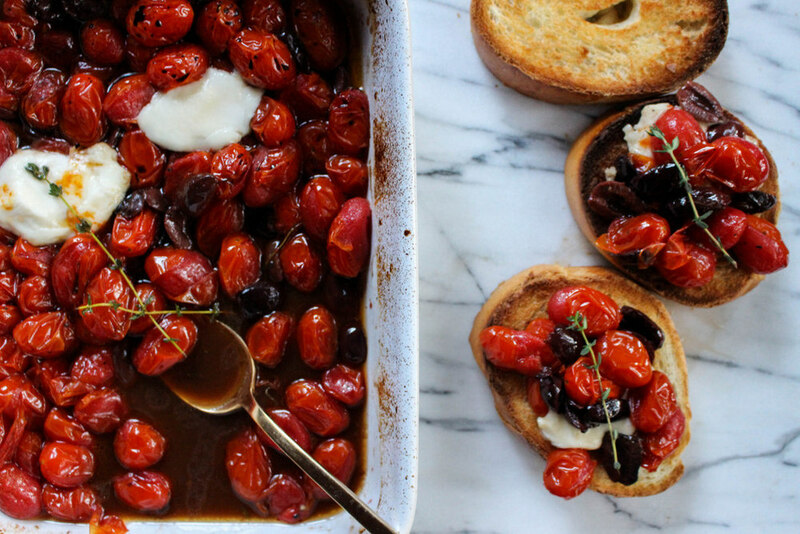 The combination of sweet tomatoes and salty kalamata olives is mouth-watering. Literally, it is the perfect pairing. Add in some fresh thyme, good olive oil and creamy mozzarella, serve as an appetizer, or do like I did. Sit down with a big bottle of wine, a fresh loaf of bread, and eat it all! Using a small roasting pan, coat the bottom with olive oil and add tomatoes, kalamata olives and a pinch of salt and pepper. Toss to combine and top with fresh thyme. Roast for 35 minutes and add mozzarella cheese. Roast for another 10-15 minutes, or until the tomatoes begin to split open. Remove from the oven and toss with balsamic vinegar. While the tomatoes and kalamata olives are roasting, slice french bread and toast until golden brown. Serve scooping the tomatoes, olives and melted mozzarella over the toasted bread. Make sure to soak up the juices with your bread, and of course, enjoy this with a big glass of wine. Have leftovers, serve the next morning with a poached egg on top.